Undoubtedly the most widely produced (over 17,000 built) andrecognizable trainer of all time is the T-6 Texan. What started as the BT-9 inthe mid-1930s went on to be used as an advanced trainer in over 40 Air Forces.Even today, it is not uncommon for people to see the T-6 as this easy tomaintain aircraft has become a perfect warbird for those who have champagnetastes and a beer budget!! The T-6G, which is the subject of this kit, is a reworking ofthe WWII era AT-6s. It includes modernized avionics (such as they were), asteerable tail wheel (usually with a P-51D wheel on it), and a new greenhousewith many of the canopy frames deleted. This gave much better visibility. Italso had all armament removed. Most of the T-6Gs were part of the MAP orMilitary Assistance Program. The new Luftwaffe and Japanese Air Force had theT-6G as their first aircraft. Academy has been well known for producing modern versions ofolder kits and this one is no exception. 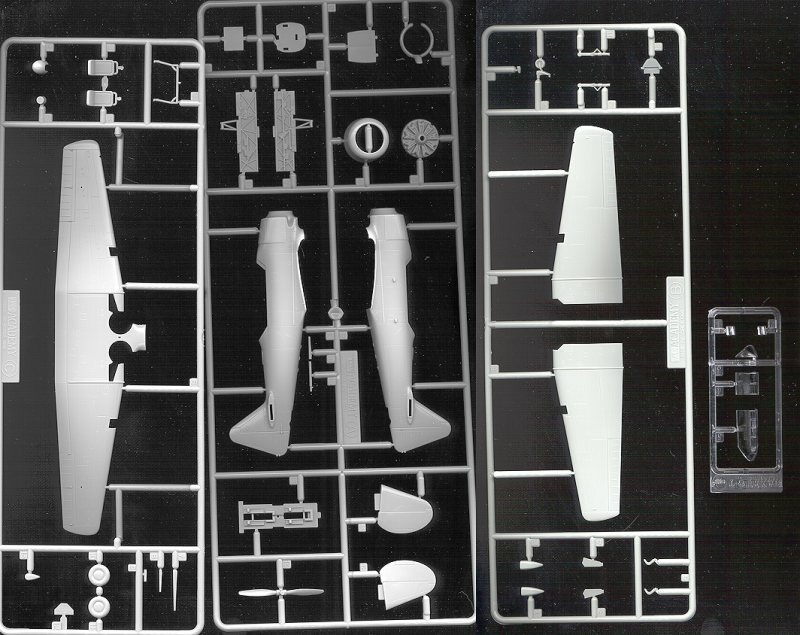 Though it looks very much like theHeller kit, there are enough differences to prevent it from being a direct copy.For instance, it has engraved panel lines, a more complete interior and aseparate pilot's canopy. There are also no underwing bomb racks or gun pods.This is enough to give it the 15% difference required by international copyrightlaws. All of that aside, it really looks like a very nice kit. TheHeller version was a super build and one of my favorites, so this one should bejust that much better. The interior is much nicer with side wall detail that isnot in the Heller version. The instructions are the usual pictograms with six constructionsteps. All colors are given in each step. The color chart gives only genericnames and no FS colors. The decals are probably the highlight of the kit. I haveused Academy decals and those in the newer kits are really very well done. Theseare no exception with bright colors and good registration. You get three schemes for this kit. Oneis an Israeli Texan that is also given in an older Microscale decal sheet. Thisone is painted in standard Israeli camouflage and the FS numbers for the variouscolors are given in a sidebar for this scheme. The other two schemes are inoverall aluminum. I don't think these aircraft were in natural metal, but werepainted instead. Someone with more knowledge on this can straighten me out if Iam incorrect. (Well, it didn't take long before I got straightened out.Tim Kalina states that the ROK AT-6 that is held in storage at the Air ForceMuseum is indeed in natrual metal. Thanks, Tim )The Korean Air Force version is quite colorful with its red andwhite rudder stripes. The USAF version is one that was used for FAC dutiesduring the Korean war. This aircraft has colored bands on the wing tips and tailtip. Many of these planes had black undersides, but this scheme does not showthat. Overall, it looks like a very nice model. Whether it is worthpaying nearly twice the price for it over the Heller kit is a choice that youneed to make. If you would like your product reviewed fairly and quickly by asite that has over 1,100 visits a day, please contactme or see other details in the Note toContributors.